December 26, 2014 – …………. ''AND LET THE FUN BEGIN''……………..
Merry Christmas to ALL….Hope it was a Wonderful Holiday for Everyone…..This was the first Christmas away from the kids and family. I think we all survived pretty good after all. 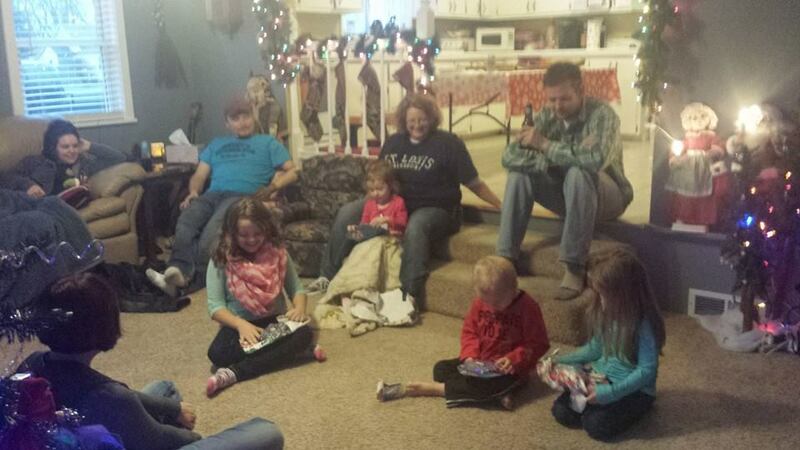 Thanks to Skype, we have been starting to talk to them and the kids love seeing us. We talked to the kids some on Christmas Eve as they all got together at Tina’s house for Christmas. They seemed to change some of the traditions of Christmas. Instead of the regular Christmas dinner of ham potatoes and all the fixings….They ordered out Pizza….Oh Well, a new tradition is born. Easy that way. 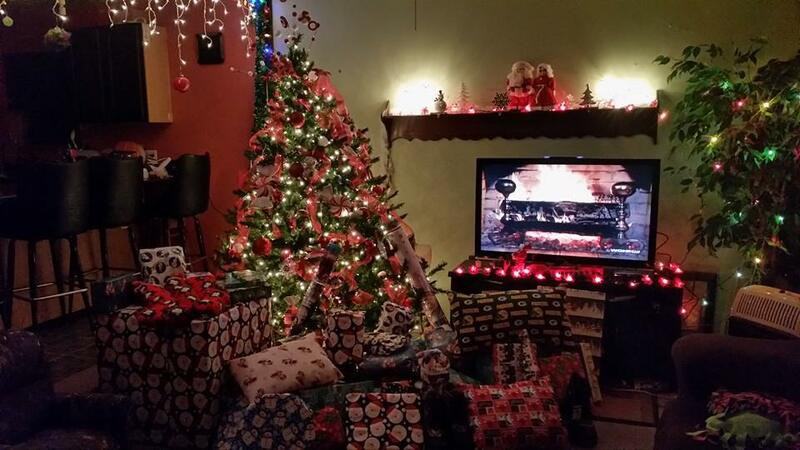 All the little kids opening their presents…. Santa even Arrived…..lol…..Ahhhhhh, gees he looks familiar……Cameron?….lol…..
Our Christmas was Celebrated at the Hall…..The Activity board usually co-ordinates all dinners and activities at the halls, but this year, they were all leaving for Christmas. Nobody to cook dinner? The park owner even supplied 7 spiral hams to cook…. We had 5 people participate in the contest….the Lady second form the right won…..Hahaha….so much fun…. Here is some of the table decorations……some elegant…some more religious…some just fun…but everyone had so much fun. You would see everyone walking around after they ate, looking at everyone’s table so they could vote later. Then I also compiled some interesting facts….Where do all the people come from….How many states are represented etc. I could not include the Texan people as most of them are now permanent residents that have moved here from another state and change their address to Texas…..So other than Texas, There are 24 states represented here. Upper Midwest is the highest….Wisc, Minn, Mich, Iowa, Ill, and Ind,…..and also have one from Maine and one from California. Many Canadians also…..4 provinces with Ontario being the highest. We also found out their is someone from Brazil in South America. Such a vast grouping of people…..We all had a wonderful time…..and guess what…..WE KEPT THEM FROM 2 till 3:30.….hahaha…..I consider that pretty Awesome…..I even had to microphone in hand….Now those of you who know me, you know I am not a public speaker….I FREEZE……but I managed…..I even brought the Bose and played Christmas Music…..Its just not Christmas without music…..and then the clean up crew went in gear and had the whole place cleaned up and ready to shut down before dark………..
Merry Christmas to All…..Onward…..Happy New Year Next…..